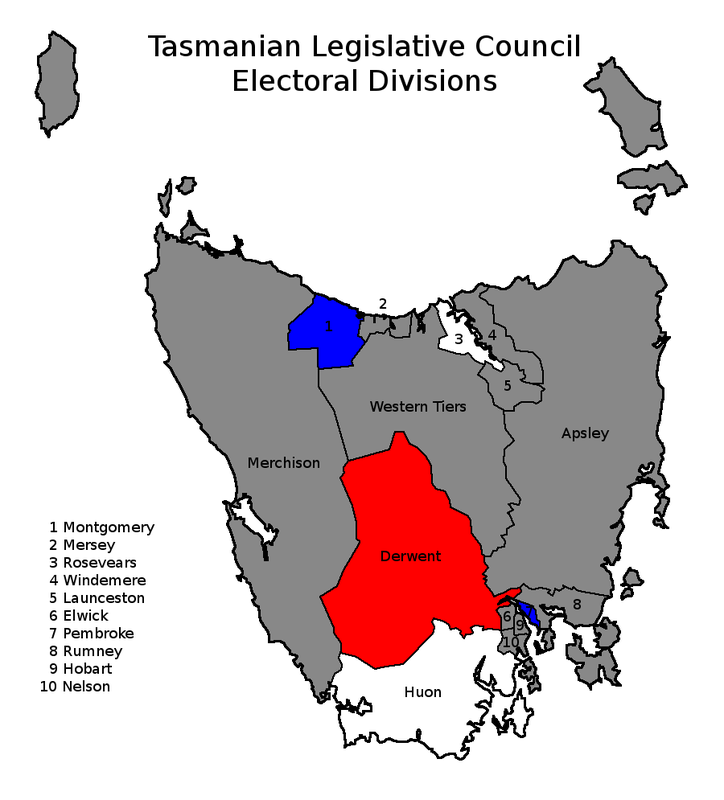 Now, since the Tasmanian lower-house is elected like every other upper-house, it should be no surprise that the upper-house is elected like every other lower-house; the state is split into 15 divisions, which then elect a single member to the parliament. Unlike most single-candidate seats, the major parties rarely do well. However, like most other houses of review, the whole house is not elected in one go. There are carry-over politicians and newly elected politicians. In most Australian jurisdictions there are two halves of the upper-house, with one half elected every three or four years. The US senate is divided into thirds and rotates over 6 year periods. 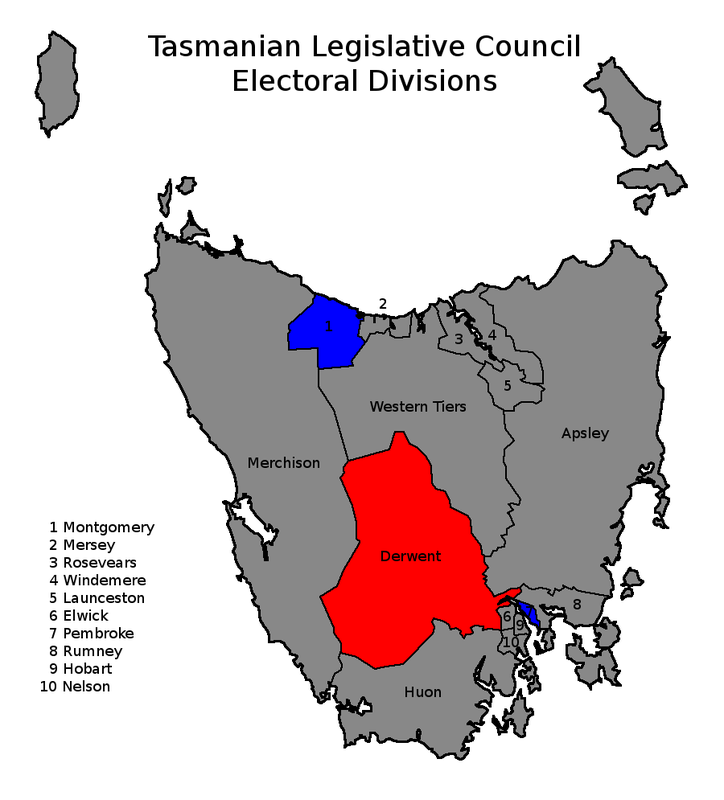 Tasmania, however, loves to be different – and loves elections – so one (approximate) sixth of the LegCo is elected at a time. Which means a new election every year. This year we are looking down the barrel of elections in Huon and Rosevears, set for May 3. This week we will be looking at Rosevears. Huon will be covered in detail next week. Of the nine candidates to represent Rosevears/Cornwall, only three were beaten in elections (William Robinson, Geoffrey Foot and Robin McKendrick) – the rest resigning their seats. This is not unusual in Tasmanian LegCo elections where incumbency is a strong factor. The 2002 election, after the retirement of Ray Bailey, saw nine contenders for the seat. Kerry Finch narrowly beat Rick Shegog on primary votes (27.23% to 23.86%) who both clearly out-stripped third place Rod Howell (17.55%). Unsurprisingly, given the power of incumbency in the Tas LegCo, Finch faced a single opponent in 2008 (Colin O'Brien) and won with over 70% of the primary vote. This election Finch is again up against a lone opponent: Liberal candidate Don Morris a former parliamentary adviser. There is little policy information available from the website of Don Morris however, it is a safe bet that Mr Morris will be attempting to help the Hodgman State Government pass as much of its proposed legislation as possible, including promoting jobs – particularly in eco-tourism. Morris is also critical of Mr Finch's perceived low attendance rate at Parliament. The West Tamar needs safer roads, better water and sewerage services, child care, walking and cycling tracks, among many other things. Like the rest of Australia, Rosevears needs more preventative health measures---let’s keep our community fit and health and out of hospitals. On education, we must encourage more skilled and dedicated teachers, and keep our schools better maintained and make them more pleasant places for kids. This last policy is of particular importance to My Finch, based on his previous record of involvement in protecting the Tamar Valley and opposition to a pulp mill in the area. The transcripts of numerous speeches by Mr Finch on this topic are to be found on his website, possibly to contradict the claims that he is not an active candidate. My prediction for this seat – based on incumbency, seat history and general presentation of message to the electorate – is a comfortable retain for Mr Finch, though probably closer than last time. The swing to the Libs in the lower house may superficially suggest Mr Morris would do well here. In Rosevears the Libs received over 50% of the primary vote in the lower house. But Morris is not running against the ALP/Green bloc this time. Instead, the choice is between a party-affiliated conservative and a non-party-affiliated centrist*. Tasmanians tend to like their independent house of review to remain, well, Independent. The Liberal war-chest will not substantially help Mr Morris either, with strict spending limits on campaigns – although a little aid from the new government publicly spruking their policies may help the contender gain some traction on the sly. Nonetheless, this is unlikely to be strong enough to unseat the incumbent, Mr Finch, who will poll strongly among ALP/Greens voters (34.7% of the primary vote in March) and any anti-pulp-mill voters in the Tamar Valley. I hear there are a few of those. That said, our pseph on the ground for Tasmania – Dr K. Bonham – is predicting a tight (or at least hard to predict) race.